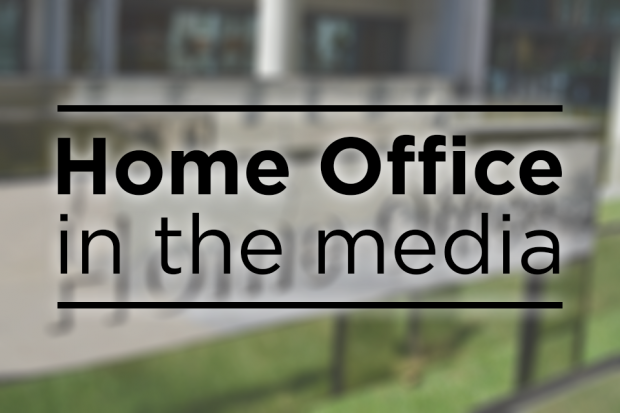 The main Home Office stories in the media today include further coverage of prosecutions under the Psychoactive Substances Act involving nitrous oxide, the issue of a data leak of sensitive immigration data, and a report profiling the fines given out to the landlords of illegal migrants. There is further widespread reporting of the court case that collapsed this week at Southwark Crown Court in which a judge decided that the sale of nitrous oxide was exempt from the Psychoactive Substances Act. The papers report that the case collapsed after the defence successfully argued that nitrous oxide, which can be used for pain relief, was covered by an exemption allowing medicinal products. They add that the implication of this judgment, and indeed a similar judgment made at Taunton Crown Court in Somerset last month, is that prosecutors could decline to bring charges against people suspected of crimes linked to the sale of the drug, demonstrating a clear loophole within the legislation. The Times, Guardian, and City A.M. report that the Home Secretary is under pressure to limit the people who have access to official figures after the UK Statistics Authority criticised the release of sensitive immigration data about international students. They also report that an initial investigation by the Home Office has established that about 50 members of staff were given access to the data before publication. The Government has clear rules around pre-release access to official statistics and the Home Office followed these to the letter. We have already submitted a report to the Office for National Statistics and we are committed to investigate this matter working with the UK Statistics Authority. It would be inappropriate to comment further. The Mail reports that hundreds of landlords who let illegal immigrants stay in their properties have been fined in a new government crackdown. It is reported that penalties of £163,000 were imposed after the Right to Rent scheme was brought in last year. The piece adds that fines were issued to 236 property owners between February 2016 and June 2017, and that the Home Office had confirmed that the number of landlords fined had more than tripled in just over a year. We believe in creating an immigration system which is fair to people here legally but firm with those who break the rules or who enable others to do so. The Right to Rent scheme deters people from staying in the UK when they have no right to be here. We regularly meet with representatives from the private rented sector, local authorities and housing charities, to discuss and monitor the scheme. Landlords can avoid the risk of a civil penalty by conducting simple and straightforward checks on tenants’ documents in accordance with Home Office regulations.